Peppers are to a pantry as white shirts are to a wardrobe- An absolute must have! I love peppers for the sheer creativity they allow its maker, and also how seamlessly they fit into almost every cuisine. That is probably the reason glorious pops of green,red,yellow and orange are ubiquitous to my biweekly stock of produce in the form of fresh peppers. It’s an ingredient that is always good to have lots of, because there are so many ways of treating them and incorporating them into a menu of your choice. Stuffing peppers is a popular method of treating this beautiful ingredient. It is a method that is common to most cultures across the world and they each have their own unique way of preparing them. I personally quite enjoy eating peppers that are prepared in this manner. This recipe for the roasted Mexican poppers is loosely inspired by a famous Mexican dish- ‘Chiles Relleno’. Instead of coating them in a batter and then frying the peppers, I just roast the hollow peppers before filling them and then re-roast them with a topping of cheese. 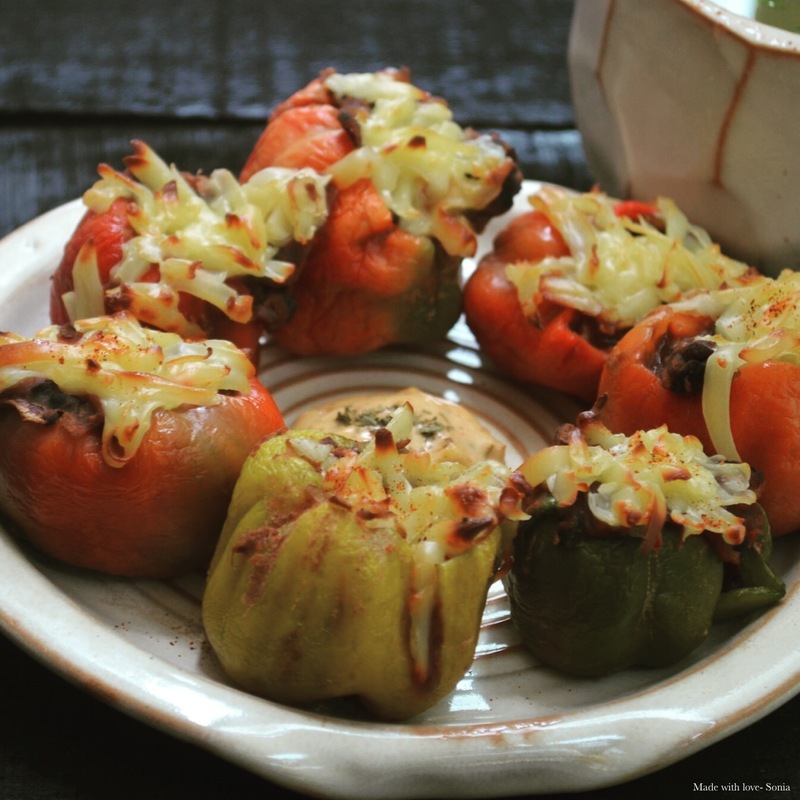 Also, the use of baby peppers makes them perfect bite-size appetisers unlike the traditional ‘Chiles Relleno’ which is largely consumed as a main rather than an appetiser. Drain the black beans that have been soaking overnight, and set them aside. Heat the oil in a heavy bottom pan on high heat, and add the onions and sauté until translucent. Add the crushed chilli-garlic paste and continue sautéing for another 2-3 minutes. Mix in the tomatoes and ground cumin and continue to stir. To this add the beans and let it simmer for about 2 minutes, pouring in the water gradually as you continue stirring. Now use a masher to mush up the beans mixture, continue doing so until the beans have broken down to resemble a thick paste like consistency. and then add the salt and red chilli powder and give it a good stir. You can add some water it the mixture looks too dry. Let the beans continue to simmer on low heat for another 10 minutes and cover your pot with a lid so as to avoid the beans from getting dry. Take it off the heat and allow it to cool, as you get on with chargrilling your peppers. Arrange your peppers with their tops chopped off and hollowed on to a baking tray. Use a brush to light coat the skins with some olive oil and pop them into the oven at 180°C for about 8-10 minutes. Remove the peppers from the oven once they begin to darken at the edges. Leave them to cool on a wire rack until they are cool enough to touch. Take a tablespoon of the beans filling and fill your pepper till the brim and top them off with some grated cheese. Repeat this process to fill all the peppers and then place them into the oven, at 180°C for about 10 minutes or until the cheese begins to melt. Remove the peppers from the oven and serve hot, with dusting of paprika. I used a homemade peri-peri aioli as dipping sauce with my poppers, but you can use anything that you might fancy.